Note : Produced by Peter Kruder (Peace Orchestra, Voom Voom), Christian Prommer (Fauna Flash, Trüby Trio, Voom Voom) and Marsmobil mastermind Roberto Di Gioia. Two labels have now decided to get down to business for this great new Marsmobil album: Compost Records and G-Stone, both by mutual agreement in a global label-cooperation just for this project. Why? We believe that together we will be stronger because we both want to do this. "Minx" was produced by Peter Kruder (peace Orchestra, Voom Voom), together with Christian Prommer (Fauna Flash, Trüby Trio, Voom Voom) and Marsmobil mastermind Roberto Di Gioia. The 2nd Marsmobil album "Minx" has challenging quotes, is both emotional as well as very personal and has the potential to reach a very big audience. The lascivious power of Air, the family feeling of the 70´s band "America", some of "Talk Talks" frailty...this album has all that and much more. Roberto Di Gioia´s maturity as an artist has been developing character and depth all these years. His fundamental musical training, experience, versatility and virtuosity are the ideal embodiment of (actually the rediscovery of) a new type of creativity: songwriter, musician, frontman, stylist, producer, multi-instrumentalist (piano, sitar, guitar, bass, drums, programming) In short: a Mastermind personified. Roberto Di Gioia was born in Milan in 1965. He began playing piano at age 4. His favourite music: the Beatles. In 1975 he began his studies at the musicial highschool in Eichstaett and after graduating in 1984 moved to Munich. There he began his career as a prize-winning professional musician. He became famous as the brilliant keyboarder in Klaus Doldinger´s "Passport" and has performed on almost every album and permanently toured since 1990. He has also worked with numerous American Jazz stars like Art Farmer, Johnny Griffin, Joe Lovano, James Moody, Tom Harrell, Clark Terry, Gary Peacock, Dave Holland and Woody Shaw, as well as German greats like Albert Mangelsdorff, Uwe Ochsenknecht, Udo Lindenberg, Till Brönner, Klaus Weiss and Helge Schneider. 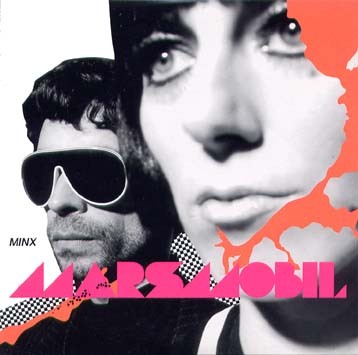 At the end of the 1990´s Di Gioia desired a personal extension of his musical creativity: "Marsmobil" was born and manifested itself for the first time in 1999 as vinyl on Payola Records. One year later the Marsmobil song "Palak Paneer" was chosen by female director Esther Gronenborn for the Soundtrack of her film "alaska.de". "Marsmobil´s" debut album "Strange World" (ACT Records) was the quintessence of his musical accomplishment to date. Here Jazz- elements ("Crazy 5"), Indian music ("Talam Mishra"), Lounge-Pop ("Flowers"), Ostinati (Hand in Hand") and Trip Hop ("Trust") melt into an extremely harmonic unit, together with such illustrious guests as Klaus Doldinger, Till Broenner, Nils Landgren, Johannes Enders, Dan Berglund and Wigald Boning. In 2005 the Fauna Flash Remix of Marsmobil "Flowers" was chosen by Gilles Peterson for his Chart-of-the Year. Sonar Kollektiv/Jazzanova have licenced the song for their "Secret Love" compilation. Furthermore, Roberto has contributed keys, bass and vocals to the Voom Voom album and will play one or more parts on the soon to be released Peace Orchestra long-player as well as on Trueby Trio and Fauna Flash productions. Roberto virtuall discovered singer Martine Rojina. She gives Marsmobil the authenticity of a big pop project without falling back on platitudes or clischees. Martine definitely has an aura and projects security and an unbelievable presence on stage which she never uses as a plagiarism or makes her appear as "just another front girl". She is more like a critical but life-loving Neo Mod with unbelievable charisma, charm and life in her voice that carries you away. Actually "Minx" means a "brazen" or "mischievous" girl. The Marmobil song "Munich Loves You" is the official song of the city of Munich´s Image Campaign for the Soccer World Cup. The single will be presented to millions of soccer fans world-wide in the Munich Allianz Arena during the World Cup games, as well as in TV trailers before every game in conjunction with the journalistic presentation of the World Cup city. This hasn´t happened by chance because behind all of it there´s a lot of work, fun and games. The single "Munich Loves You" will be released previously and is not part of the album because there are at least 3 or 4 such "hand-grenades" on it. Marsmbil is a compact, super Live-Band. There´s a video to "Mangia Amore". "Minx" was mastered in Abbey Road Studios, where Roberto took a piece of the studio wall which he always carries with himself. Voici la première coproduction entre Compost et le label de Kruder & Dorfmeister G-Stone, produit par Peter Kruder (Peace Orchestra, Voom Voom), Christian Pommer (Fauna Flash, Trüby Trio, Voom Voom) avec le leader du groupe Marsmobil Roberto Di Gioia. La maturité artistique de Roberto Di Gioia's s'est développé durant de nombreuses années. Son "entraînement" musical, son expérience et sa virtuosité ont produit les germes idéaux d'une nouvelle forme de créativité: songwriter, musicien, styliste, producteur et surtout multi instrumentiste (piano, sitar, guitare, basse, batterie, programmation). Né à Milan en 1965, il commença le piano dès l'age de 4 ans. Parmi ses groupes favoris: les Beatles. En 1975 il commence ses études à l'école de musique de Eichstaett et après avoir obtenu son diplôme, déménage à Munich en 1984. C'est là qu'il commence une riche carrière de musicien classique. Il devient célèbre et gagne la reconnaissance de ses pairs grâce à ses talents de pianiste avec le "Passport" de Klaus Doldinger. Il a aussi travaillé avec un nombre impressionnant de stars du Jazz américaines telles que Art Farmer, Johnny Griffin, Joe Lovano, James Moody, Tom Harrell, Clark Terry, Gary Peacock, Dave Holland et Woody Shaw, mais aussi avec des personnalités allemandes. A la fin des années 90, Di Gioia désire étendre sa créativité musicale: "Marsmobil" est né et se fait remarquer pour la première fois avec un vinyle sur Payola Records. Inspiré par les sons trashy analogiques et l'esthétique des années 60 et 70, Marsmobil fusionne le rétro et le futuriste, la space-pop et les orchestrations à la Burt Bacharach, pour un résultat salué par la presse allemande. Et de fil en aiguille Di Gioia est ensuite impliqué dans des projets divers ces dernières années comme avec les Notwist ("Neon Golden"), Console ("Reset The Preset") et Till Broenner ("Blue Eyed Soul"). En juin 2003 le saxophoniste Tim Ries lui demande d'enregistrer sur l'album "Music of the Rolling Stones" avec Charlie Watts, Bill Frisell et Darryl Jones. Le premier album de Marsmobil "Strange World" (sorti sur ACT Records) accueille de nombreux invités prestigieux tels que Klaus Doldinger, Till Broenner, Nils Landgren ou Wigald Boning.